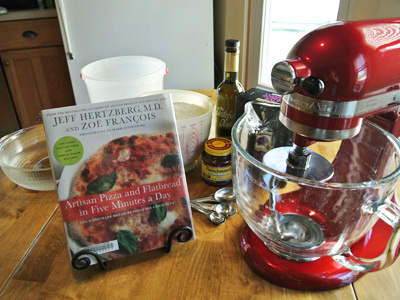 My new favorite book “Artisan Pizza and Flatbread in Five Minutes a Day” has changed the way I think about pizza. 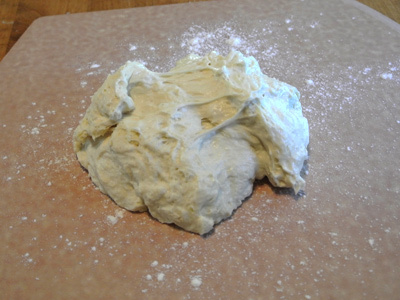 The master recipe makes a big batch of dough that can be made ahead of time and placed in the fridge for up to 2 weeks. 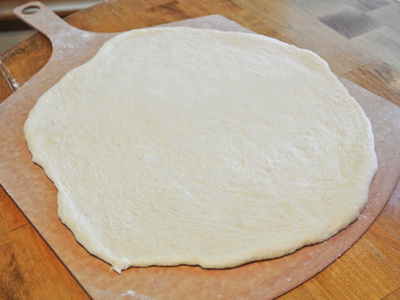 Once the dough has been made you can take scissors and snip off just the amount of dough you need for any size pizza. 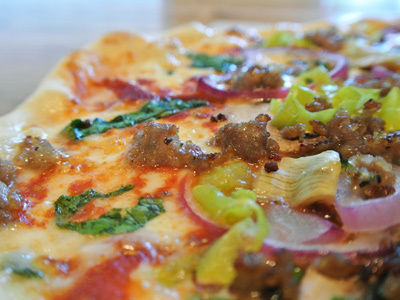 The crust will taste fresh and crisp just like you taste in a pizzeria. I’ll admit I was a bit skeptical about working with cold dough out of the fridge, but honestly it was very easy and the results were amazing. The major differences in this dough is that you don’t knead it ahead of time, just incorporate all the flour into the wet ingredients and let it sit at room temperature to rise. 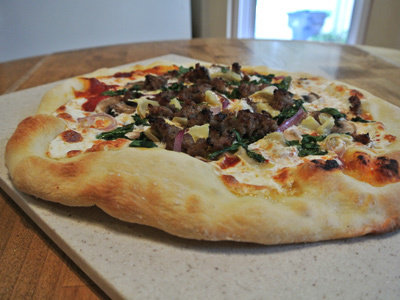 Also the dough takes on that crispy crust by cooking on a pizza stone or a cast iron griddle at very high heat. Already having a stone and cast iron griddle, I invested in a pizza peel in order to transfer the pizza on and off the hot stone. With the master recipe I was able to make 5 pizza crusts although I probably could have squeezed out another one or two if I had made thinner crusts. It’s all in your preference of how thin or thick you like your crust. This is the book that holds the Master Recipe! You’ll need a 5 gallon plastic container with a lid. 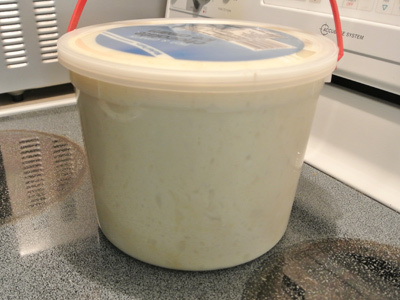 I had a 5 quart ice cream bucket that worked just fine. 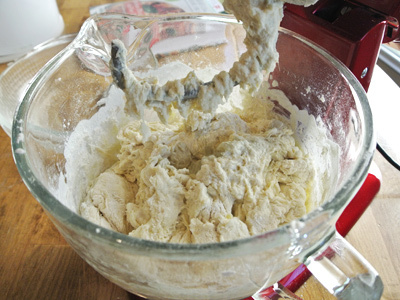 You can mix the dough by hand in the bucket or use your stand mixer. I’ve made a batch in each and found that it’s just a preference. 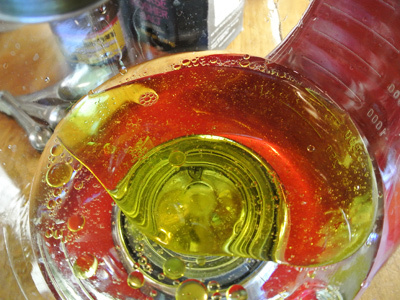 The stand mixer makes it easier but more cleanup while mixing in the bowl gives you a workout with little cleanup. I made the olive oil version which cuts the water amount to 3 cups plus 2 tablespoons, 1/3 cup olive oil, 1 tablespoon yeast, 1 tablespoon Kosher salt, 7 1/2 cups all purpose flour. The water should be lukewarm, 100 degrees or below. 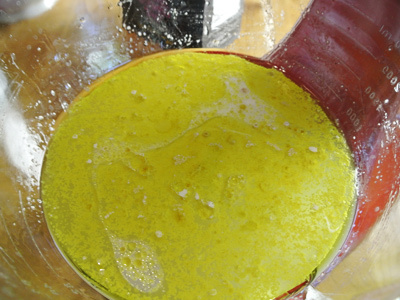 Mix together the water, olive oil and yeast. Let sit for a few minutes until the yeast activates and starts to foam. They used a method of scoop and sweep to measure the flour. 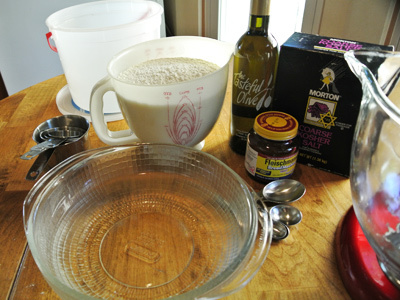 After each cup of flour I would incorporate it either by mixing it with the mixer or by hand. Wet your hands to get the last bit of flour to incorporate it it becomes difficult. Remember, you’re not kneading it, just making sure to uniformly moisten without dry patches. 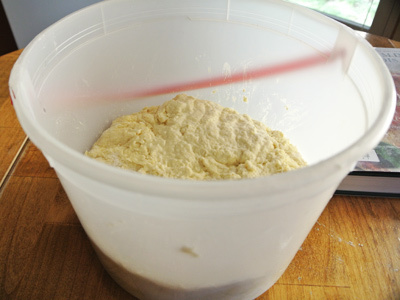 Place the dough inside your plastic container (unless you’ve mixed it by hand inside the container) and set at room temperature with the lid just set on top, not tight. 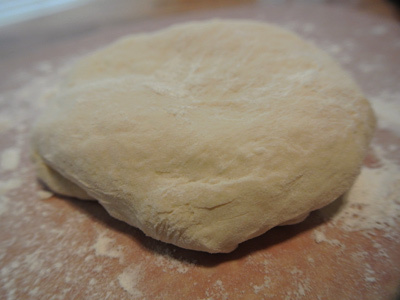 Within 2 hours you’re dough should be to the rim and ready to place in the fridge. Now mine kept growing until it busted the lid off but I just pushed it back inside, replaced the lid and it was fine. It is suggested to let the dough sit in the fridge at least 3 hours or overnight. 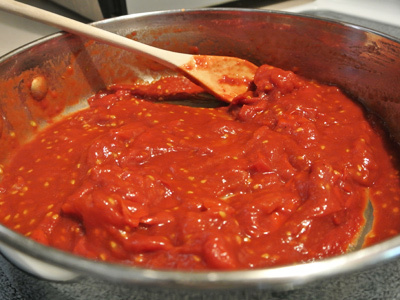 While the dough is chillin out in the fridge I’m going to make a pizza sauce that’s really easy to make and tastes so good. I love this cherry tomato sauce made with a pint of cherry tomatoes, some traditional balsamic vinegar, olive oil, salt and pepper. 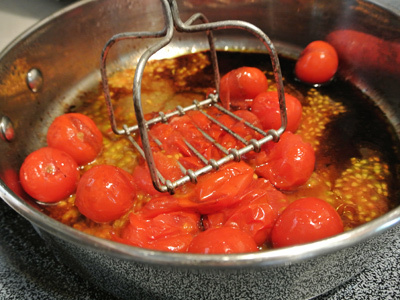 Drizzle 2 tablespoons olive oil in a heated saucepan, place the tomatoes, balsamic vinegar, salt and pepper. Cover the pan, turn the heat to medium low and let simmer for 10 minutes. After 10 minutes the tomatoes should be soft and just about to burst. A potato masher makes for quick and easy work. 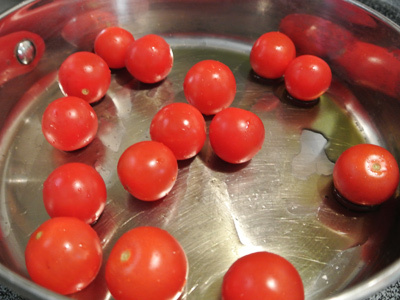 Gently mash the tomatoes but be aware that sometimes those little tomatoes squirt back. The tomatoes are still a bit thin so to thicken it add 2 tablespoons of tomato paste. That thickened up nicely. Take a taste and see if it needs any more salt and pepper. This sauce was enough for four “12 inch” pizzas. Store in the refrigerator until ready to use. I let it sit overnight and today I’m taking my first look. It’s really wet but not as sticky as I would have thought. Take a piece of dough and snip with scissors. The first time I cut a chunk of dough about the size of a large grapefruit and it made a thick “pan like” crust. A baseball size dough made a medium crust that bubbled around the edges. This is where you’ll need extra flour. I kneaded the piece of dough right onto my pizza peel. 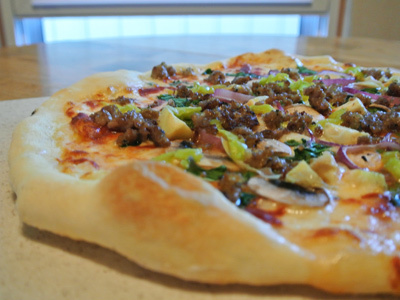 In order for the pizza to slide easily you’ll need to make sure it’s good and floured. Sprinkle a bit of cornmeal over the peel before your last roll out to make for an easier slide onto your hot stone. Before you get started preheat your oven to 500 degrees and set your stone to heat for at least 30 minutes. This was the “Pan Pizza”, a bit thicker crust. This is where you get to choose whatever toppings you like. I also had some sweet Italian sausage that I browned for those who like meat on their pizza. I’m partial to veggies though, with lots of cheese. 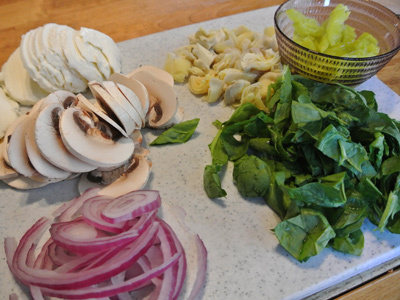 I’m a firm believer in fresh mozzarella on a pizza. It melts and tastes so good. Spoon your sauce over the cheese. 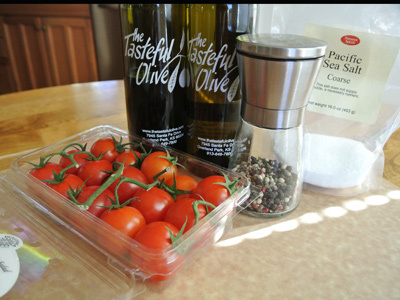 Place your toppings, drizzle with olive oil and sprinkle a little salt over the top. Before sliding this into the oven, make sure your pizza stone or cast iron griddle has been properly heated in the oven for at least 30 minutes at 500 degrees. 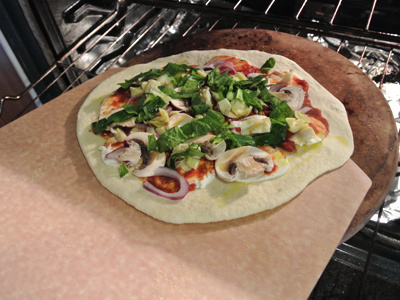 With proper flour and cornmeal underneath your dough it should slide easily from the peel onto the pizza stone. 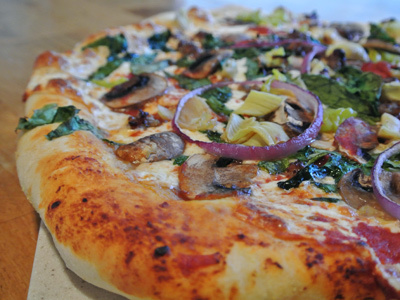 I found that a medium crust took about 7 – 8 minutes while the thicker crust took about 10 minutes. Here is a medium crust. 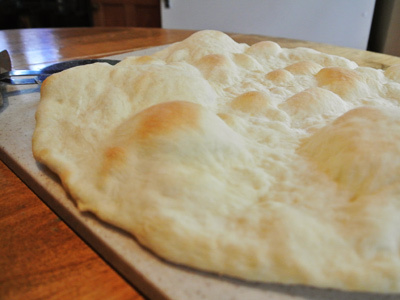 I rolled this dough to make as a flatbread crust for Greek Nachos. I used the pizza cutter to cut pieces of crisp hot pita bread to use for the nachos. With no toppings this took 6 minutes to bubble and brown. One with sweet Italian sausage. And a veggie pizza for me! 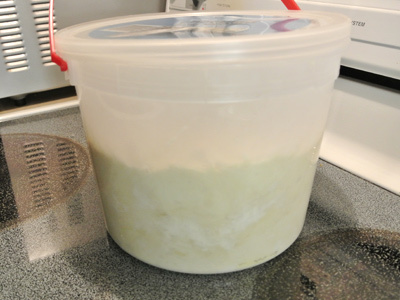 In a large mixing bowl or 5 gallon plastic container with a lid, combine water, olive oil, yeast and salt. 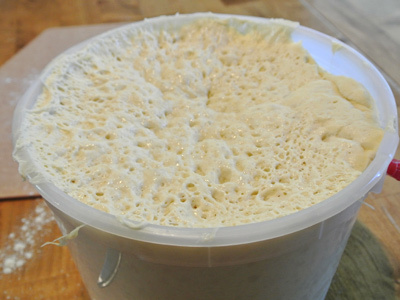 Let sit a few minutes while the yeast activates and begins to foam. 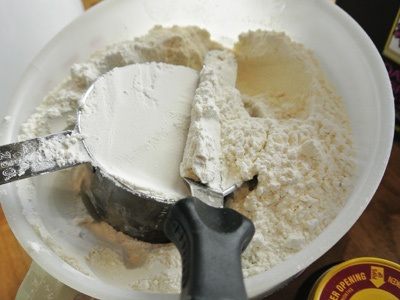 Measure the flour with the scoop and sweep method and begin adding a cup at a time. 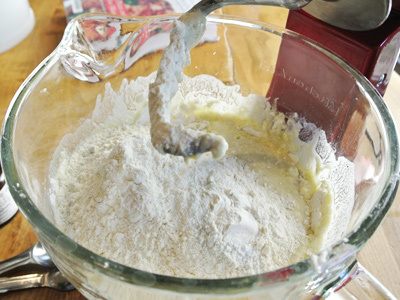 Use a wooden spoon to incorporate the flour with the wet mixture. Do not knead, it isn’t necessary. You may need to use wet hands to incorporate the last bit of flour. 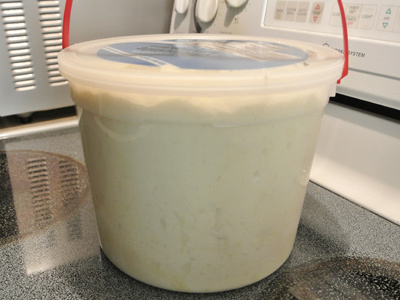 When everything is uniformly moistened without dry patches, transfer to a 5 gallon container (unless you have mixed your dough in this container) and allow to rise at room temperature, about 2 hours. Do not punch down the dough. With this method try to retain as much gas in the dough as possible. 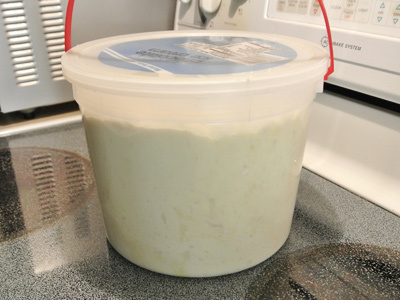 If the dough rises to push the lid off, gently push the dough back inside the container, reseal the lid and place in refrigerator. You may refrigerate the dough up to 2 weeks. The dough will develop sourdough characteristics over that time. Thirty minutes before baking preheat oven to 500 degrees (or your oven’s highest temperature). Prepare a pizza peel or other surface with flour and cornmeal to prevent pizza from sticking and allow to slide off peel. 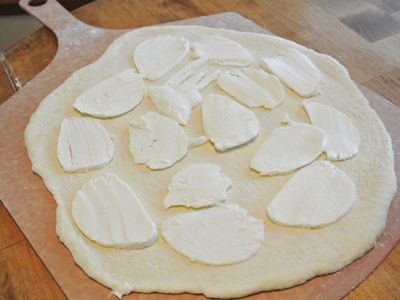 Using scissors, cut a baseball size ball of dough using the flour to help shape into a disc. 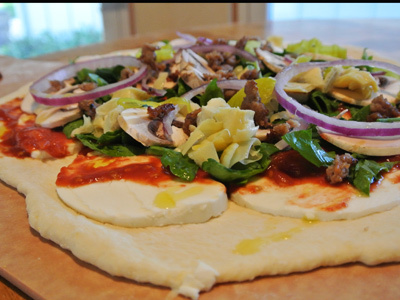 Roll out the dough using a rolling pin or pizza roller onto the peel. When the dough is stretched to the size you want, make sure there is enough flour and cornmeal underneath to slide easily from the peel. 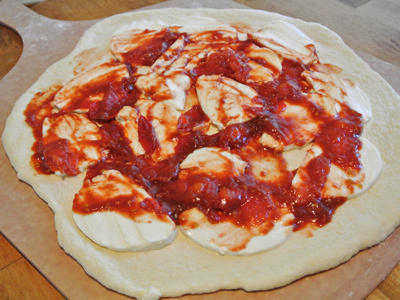 Start placing slices of fresh mozzarella, cherry tomato sauce, and any toppings of your choice on top of the dough. Slide the pizza onto the preheated stone. 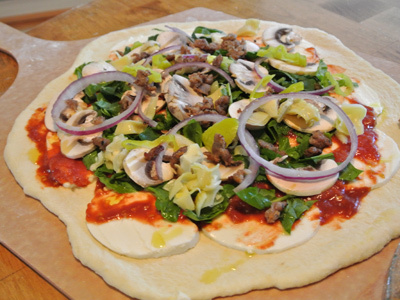 Place the tip of the peel near the back of the stone, close to where you want the far edge of the pizza to land. 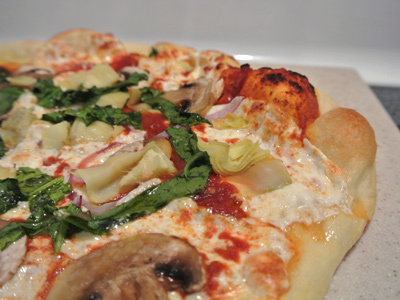 Give the peel a few quick forward and back shakes and pull it sharply out from under the pizza. Check for doneness in 7 – 8 minutes, or 10 minutes for a thicker crust. Turn the pizza if one side appears to brown faster than the other. It should be easy to slide the pizza back onto the peel once the pizza has cooked. If necessary, use a spatula to help slide it back onto the peel. Allow to cool slightly, slice and enjoy. 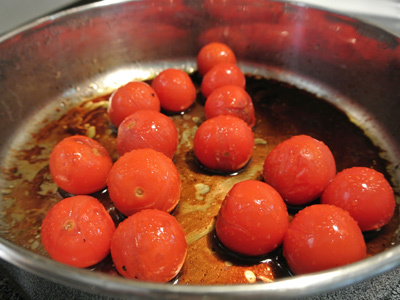 In a medium saucepan, combine cherry tomatoes, olive oil, balsamic vinegar with a sprinkle of salt and pepper. Place a lid on the saucepan, turn down the heat to medium low for 10 minutes. Tomatoes should be soft and almost to bursting. Using a potato masher to crush tomatoes in the pan. 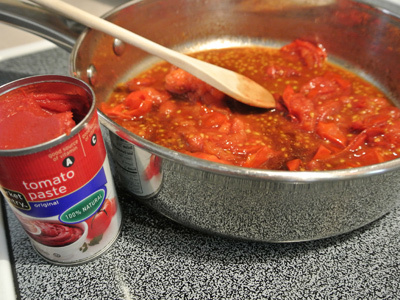 Add 2 tablespoons of tomato paste to thicken the sauce, salt and pepper to taste.